Colour: Brown Design: floral Material: Bone/MoP, Resin, MDF & Wood Dimensions: 55-1/2" W x 22" D x 36H. Porous Surface, Avoid liquid spillage. Use grout sealant to protect against spillage Slight irregularities in the resin and inlay may exist. Hand-Made by skilled craftsmen using honourably sourced bone/mop. Intricate hand carved bone detail. A versatile designer piece that will make a statement in any space. Ample storage and smooth opening. You should expect to receive it within 10 to 12 days after dispatch. Kindly provide your Mobile No. Since these items are made on order, we do not take them back. We take at most care of the specification, colour and quality, and that is what we assure you will get with each of our products. Nonetheless, if you are unhappy with the product, do let us know, and we can look into the grievance on a case by case basis. The item should NOT be used and NO alterations should be done to the product otherwise we won't accept the return. All payments need to be made upfront. As they say - "Communication is the key to any relation", communicate your problem, grievance for faster resolution of any disputes. If you like our product please do tell others. 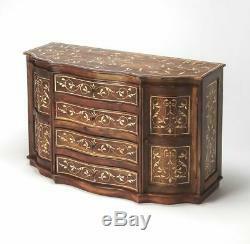 The item "Chevrier Traditional Bow Front Bone Inlay Sideboard Medium Brown" is in sale since Sunday, August 19, 2018. 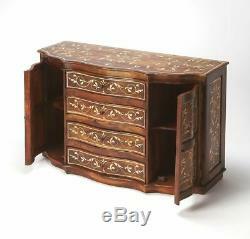 This item is in the category "Home, Furniture & DIY\Furniture\Tables\Side/End Tables". The seller is "supremesalesagency" and is located in MUMBAI, MH. This item can be shipped worldwide.